We are head over heels in love with our Hello Sunshine Natural Sunscreen! The sunscreen glides on smoothly but is thick enough to stay on for powerful protection. No ghosting and great for the whole family! Hello Sunshine is free from all synthetic preservatives and parabens. Natural, safe and smells delicious! Apply evenly onto dry skin 20 minutes prior to sun exposure. Re-apply every 90 minutes and at regular intervals especially after swimming, exercise or towel drying. Avoid prolonged sun exposure and wear protective eyewear & clothing. Avoid contact with eyes. Patch test first and discontinue use if irritation occurs. Please note unlike many sunscreens on the market we have full ingredient disclosure because you deserve to know what is in the sunscreen you put on your family and every ingredient has been carefully selected to create this beautiful and natural sunscreen. Like coconuts themselves, coconut oil is rich in many proteins. These proteins keep skin healthy and rejuvenated, both internally and externally. Proteins also contribute to cellular health and tissue repair. Coconut oil has a natural SPF and is a great protecter. Coconut oil is a brilliant moisturiser for all skin types, especially dry skin and is safe for babies and kids making an excellent nappy and skin cream. It also speeds up the healing process of bruises by helping to repair damaged tissue, it penetrates deeply and is nutrient rich. We adore coconut oil for its therapeutic activity and use it as a base of many of our products. Beeswax has a number of benefits for the skin, including an anti-inflammatory action that helps to calm and soothe. It forms a protective barrier on the skin to guard against irritants and lock in moisture. We use beeswax in Hello Sunshine to help our water resistance. Unlike ingredients made from petroleum, beeswax doesn’t suffocate the skin and won’t clog the pores. It is excellent to use for skin conditions such as eczema and psoriasis. We have chosen to use beeswax for its skin healing properties. It’s also antibacterial and soothes tender skin! Bees are amazing and are in great danger around the world. We adore and respect our bees! Castor Seed Oil is a vegetable oil created by pressing the seeds of the castor oil plant with a natural SPF of around 5.6 providing natural protection from oxidative damage. Castor Oil contains essential fatty acids and antioxidants making is a great addition to Hello Sunshine. Yes. We don’t use any chemical or synthetic preservatives in hello sunshine… and by that we mean Nothing. Zero. None. Nada. Zilch. Zip. Absolutely not. We don’t believe in using parabens within any of our product range. Parabens are possible endocrine disrupters and while they are what gives the sunscreen a smooth glide on finish we believe we have been able to achieve this by using naturally based ingredients like beeswax and fractionated coconut oil. It should not stain clothes since it does not contain organic solar absorbers which are renowned for fabric staining. However, this is fabric dependent and we encourage you to test this for yourself as we cannot offer guarantees about clothes staining. Is your sunscreen nano or non-nano? We have chosen a zinc oxide within our sunscreen that is not a nano zinc oxide. However, the sunscreen may contain nanoparticles. To explain, all powders contain nanoparticles in small amounts, every zinc oxide source will contain low concentrations of sub nanoparticles, this has always been the case. The zinc oxide that we use is called ‘micronised zinc oxide’, this means that it is not predominantly nano. We have chosen the highest quality zinc oxide that we have been able to source for our sunscreen. Yes, but as per instructions needs to be re-applied frequently after swimming. From what age can I use hello sunshine? 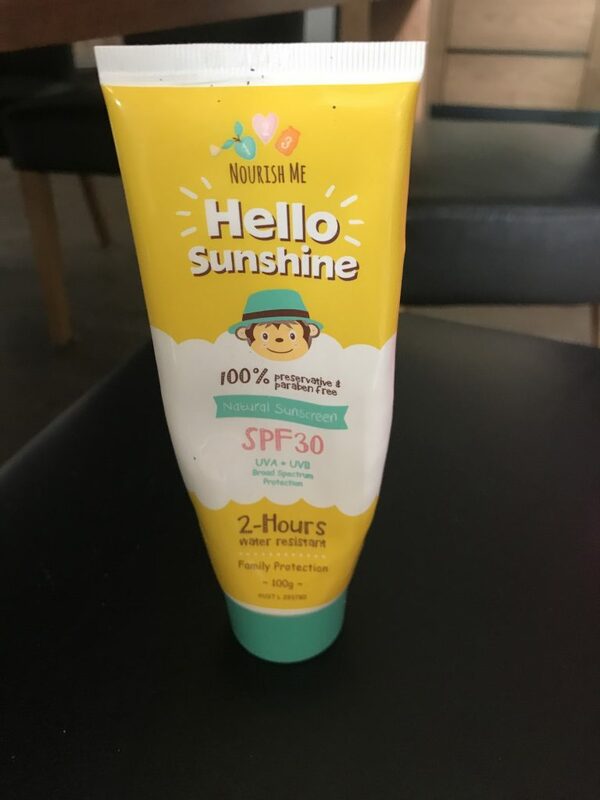 Hello Sunshine is the perfect natural sunscreen for babies. It can be used safely from 6+ months. Is your sunscreen TGA approved and tested? Is Hello Sunshine ‘reef friendly? There is some scientific evidence that oxybenzone, a sunscreen active, could be contributing to coral bleaching. We don’t use oxybenzone in any of our products and we don’t use any oxybenzone in Hello Sunshine Natural Sunscreen. 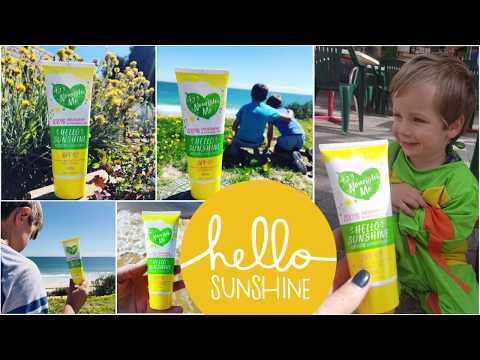 We love talking about our amazing products and Hello Sunshine Natural Sunscreen is no exception. If you don’t see the information you need here, feel free to contact us at any time and we’re always happy to help! Love this sunscreen. It is the best natural sunscreen I have tried as it is not oily and actually works in protecting skin. This sunscreen is the only one that does not give my daughter an awful, itchy rash. I have tried so many brands and am so happy I have found one that is kind on her sensitive skin. It also smells delicious! Love this sunscreen. It’s the only one my kids don’t mind putting on. And it smells delicious! The best sunscreen I’ve found and I’ve tried them all! My boys find it easy to put on and they love the smell. So wonderful to know that it’s free from toxic chemicals and created with such love! Thank you. Just purchased to get us through our holidays. Have a 4 year old with eczema and this is fantastic. No irritation or flare ups and we can all use it. Great product. Awesome product. So great to have a natural sunscreen that really works. Have just purchased 3 for my family for Christmas. Gorgeous sunscreen- beautiful smell, all my four boys love to apply it daily, goes on easy & rubs in beautifully. Thank you for creating such a great sunscreen. My kids are happy to put it at on. It is easy to spread and not thick like some natural sunscreens and they don’t end up like ghosts which my teenage girls are pleased about. This is dead set the best sunscreen on the market. It smells good enough to eat (we didn’t!!!) My kids love it because it’s so easy to apply and I love it because it’s ocean and small human skin friendly . Finally a no nasties sunscreen that the kids can apply themselves. My 8yr and 6yr old it take this with them in their lunch bags to remind them to reapply and they do so gladly. They have even had other children sniff them and say that they smell nice . Love it! My 8 year old refuses to wear sunscreen and it is a daily battle to get him to put it on. I asked him this morning if he liked our new sunscreen and he said “yeah it smells really good” (he has a very sensitive sense of smell and doesn’t say that about may things!) he said ‘Dad asked me to just put it on my face for the beach and I put it on my arms, legs and shoulders as well without being asked!” …… its a miracle I just want a bigger tube!